Om Banna is shrine near Jodhpur, India, devoted to a motorcycle god, also called Bullet Baba. 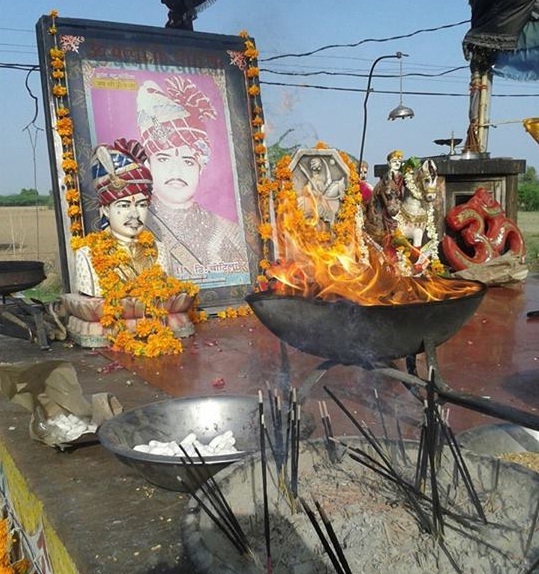 Om Banna Dham is located Jodhpur to Pali national highway shift while going to shift approximately 20 km before Rohit police station "accident prone" area of ​​the board looks more than a few steps away the side of the road in the woods about 30 to 40 offerings and prayers goods lined with shops visible as well as mirrored crowd, surrounded by a terrace on which a large photo engaged, and constantly holy burning flame and pops to see a single full of fresh flower bullet motorcycle. The bike is a Royal Enfield Bullet 350. Hundreds of devotees turn up every day to pray for a safe journey, often bearing liquor. 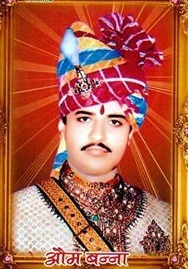 Om Banna Story: Om banna or Om Singh Rathore belongs to Rathore family of Chotila. In 1991, on the way from Pali to Chotila, he drove into a tree and his motorcycle fell into a ditch which killed him on the spot. The motorcycle was seized by the local police and taken to the police station but was found the next morning at the accident spot. The bike was seized and taken back to Police station again where it was locked and chained, but it was found at the same place next morning again. The legend says that the bike without fail made it out of the police station even when the fuel tank was allegedly emptied. It is popularly believed that no matter what the policemen did Om Bana's Bullet returned to the accident site before dawn. 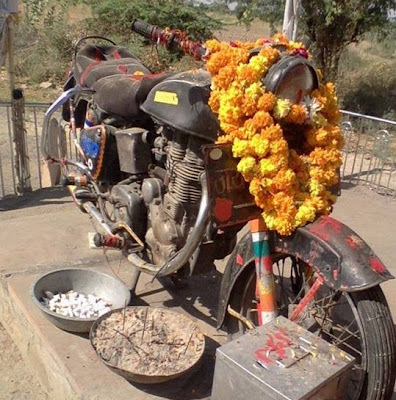 This was seen as a godly miracle by the people who continue to worship the Bullet Bike still. Om Banna Dham chotila Rohit Pali district is opened every time 24 hour in every season with holy burning flame called Jyote.There are many shopes full of worship things.There are above 50 small and big shops near by Om Bnna Ji Dham Chottila on National highway Jodhpur to Pali Ahmadabad its also opened every season in 24 hour because any time many devotes visit here. This temple is known as "Bullet Baba's temple".